The picture above is known as "The Lightning Field" by Walter De Maria. I really like this picture. 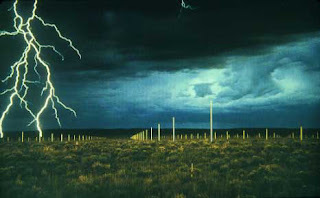 He was able to capture the picture by taking several photos in an area where there had been lightning poles put up. Some people would say this is not art, however it does take talent to get a shot like this. You need patience and to have a good angle. I really like the swirling clouds in the back right side of the picture. And the electrical current seen is amazing. This is a great picture.